Welcome to the third month of our official Brawl in the Family Fan Art winners! As usual, we were bombarded with excellent entries, but this month's input was so heavy on quality, we've had to stretch the limits of how many runners-up we can contain! Once you're done taking a look at our favorite submissions, check out the full thread of entries here. Our journey begins way the heck back in the Mesozoic era! Oh, it was a wild time. Thick-headed dinosaurs lapped at the air while Stegokoopas constantly checked behind their backs, nervous at what horrors lurked in this prehistoric wasteland. 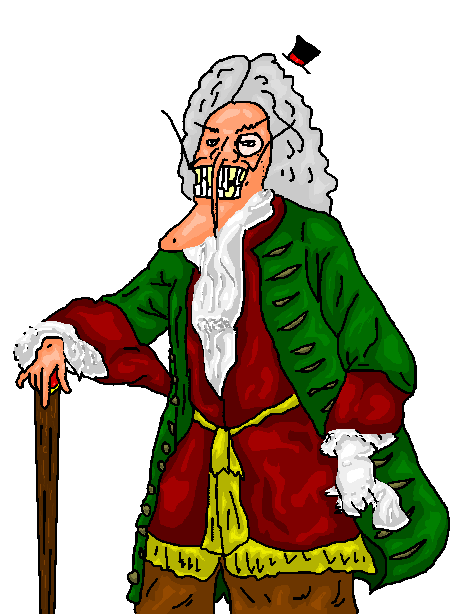 MooseFondue's done a nice job of capturing the beastly denizens of this period...in a time before Paragoombas wore shoes. The Dededinosaurs were known to be lumbering, grouchy creatures--quite territorial. Some scientists theorize that their reign swiftly ended due to a fiery collision from the cutest meteor in history. Garfunkeless's artistic rendition of this theory makes me feel like I'm almost there, witnessing the cutest apocalypse pre-Mr. Flower! 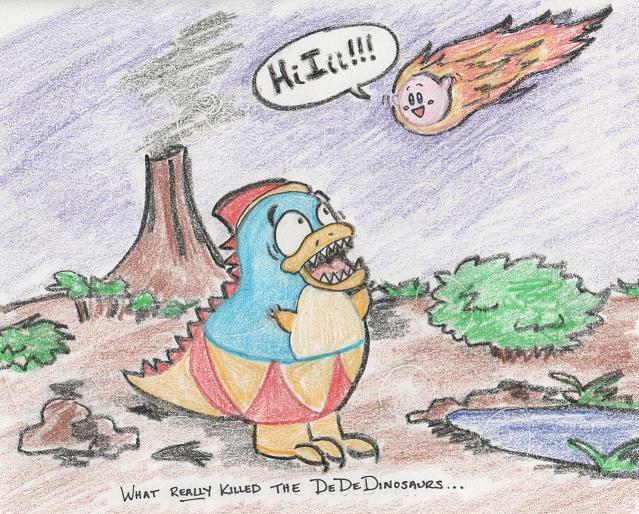 I especially like the poor Dededinosaur's face as he meets his nemesis for the first and last time. Thinks got pretty hairy during the Trojan War. Of particular note was the story of Odysseus, who took on monsters almost as hideous as this Waluigi hydra here! To make things even rougher on our hero, Poseidon's decided he's gotta get that Odysseus, and the water-belching Charybdis isn't helping matters! 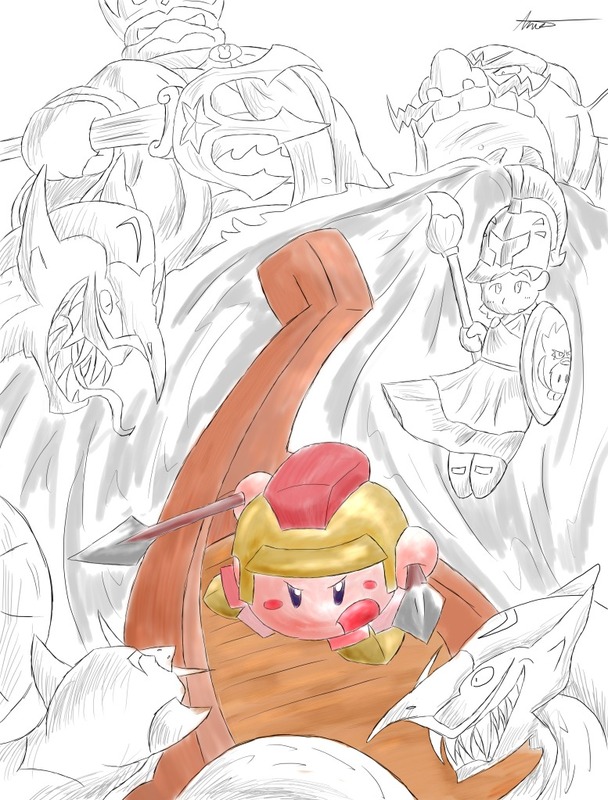 Luckily Athena's helping Odysseus out, in this lovely Kirbified image from Ame-Nami. The composition is action-packed and the attention to detail is just terrific. The Middle Ages weren't without their problems, but there's certainly something romantic about a warrior suiting up and fighting for the Pokemon he loves. This stop on our magical history tour is brought to you by Volke, who threw in a sizable set of BitFers into the mix. 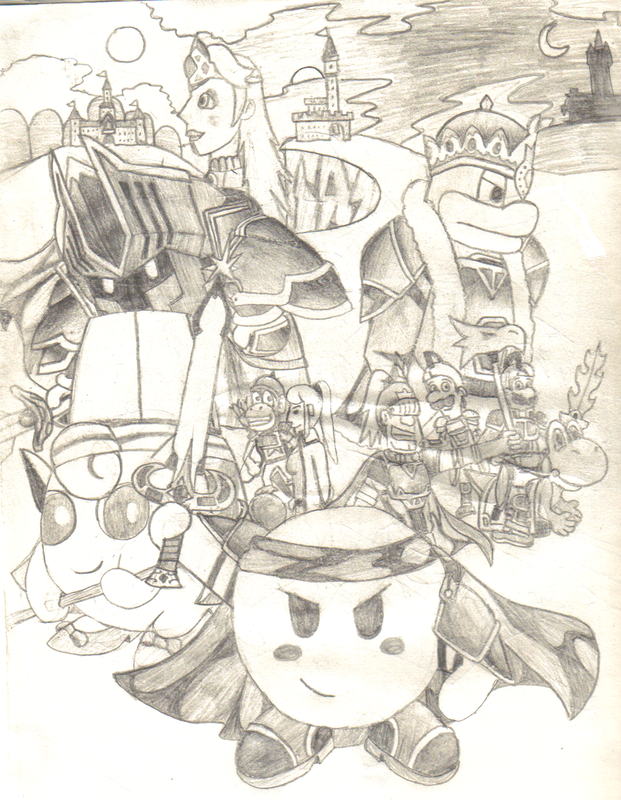 Meta Knight is decked out in black armor, while Kirby looks ready to take on anything. Tons of detail and some dynamic shading round out the collage-style image. Tally-ho, nice work, lad! In the age of shoguns, samurais, and cherry blossoms flying through the air comes this submission from three-time (!) top ten-er, Lamer_Than_You! Good to see you again, buddy. As usual, her charming style shines through in this expressive image of Kirby ready for battle as Adeleine and Dedede watch from below. 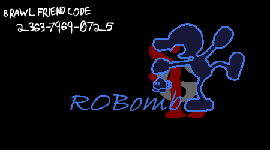 I quite like the ominous subtlety of Meta Knight in the background as well. 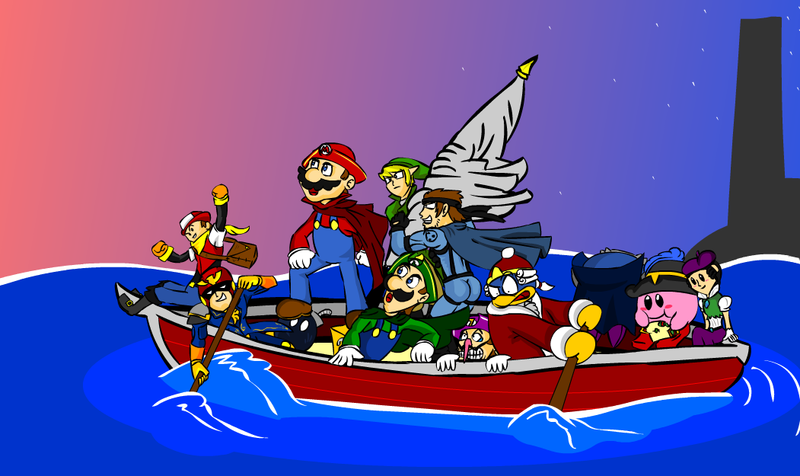 A particularly noteworthy footnote in history that's sadly left out of the books is when Mario and crew crossed the Great Sea. 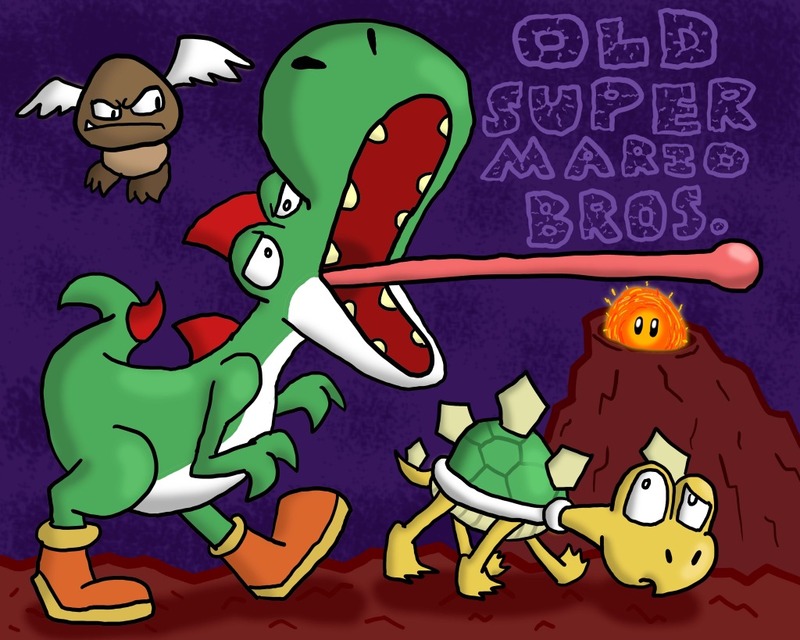 The best representation of this landmark event is in (returning nominee) Spazboy225's exciting entry here, which includes a ton of major BitF players. The poses are dynamic and the colors are excellent! However, of special mention needs to be made of Snake's omnipresent buns, somehow sneaking into the center of the image directly above Waluigi's head. Apparently the man painted above was one of great importance, but going through my history textbooks, I can't find mention of him. Truly, though, he was an artistic inspiration, as no less than three separate images of him have made their way into this tour-de-force. The first two are done by sevenstitch and truly capture the subject's majesty. The third image is by Trebor Almasy and seems like it stepped out of a Monty Python sketch. I'm sure all three of these would be worthy of being hung in the oval office, though! 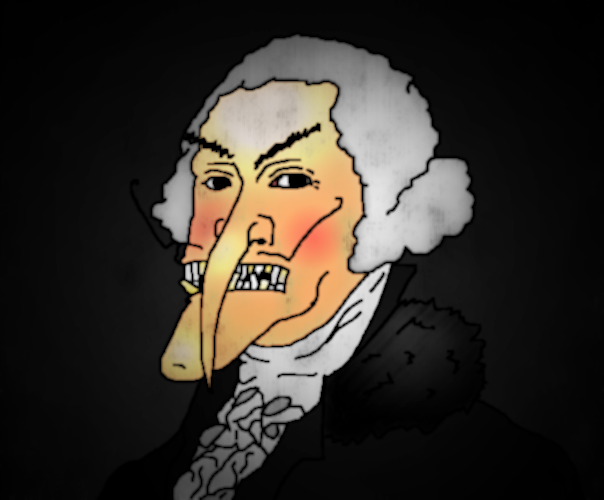 One of the most infamous Frenchman in history is pictured above. Through BitForums newcomer ajile's tres bien image, we can definitely get a sense of Wario's dynamic leadership and sense of class. The bullet bills in the background definitely add to the war atmosphere nicely! Great job, ajile, hope to see you stick around! The various characters used here are well thought out. Since this wasn't really a singular piece, we couldn't fully take it into consideration for the grand prize. We did want to represent the BitF Trail in this thread, though, and this is our favorite piece from it so it gets an honorable mention. I almost forgot this exciting image from the short-lived steampunk era in history, where plumbers flew through the skies being chased by the zeppelin-flying Baron von Koopa. Good thing Fox has got his back in this dynamic entry from a fan named P.A.S. Sorry about forgetting to recheck my inbox during the contest judging, P.A.S., and nice job on a unique and fun image! Fast-forward to the early 20th century and the advent of animation. 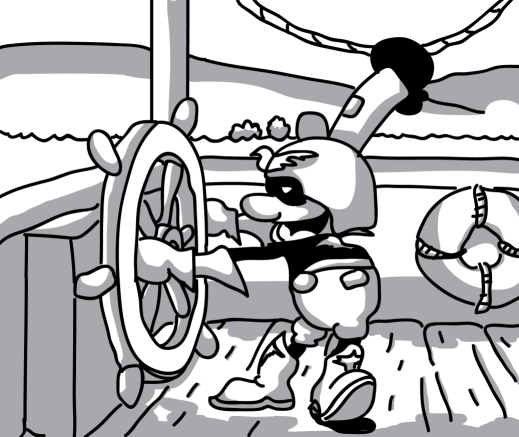 Who can forget this classic, where a whistling Captain Falcon outsmarts the burly Goroh? A screengrab is replicated here for your enjoyment, looking like it jumped straight out of the 20's! Art got pretty weird in the 60's, what with the pop art movement and images like the above, where a man in a hat has a fungus in front of his face! 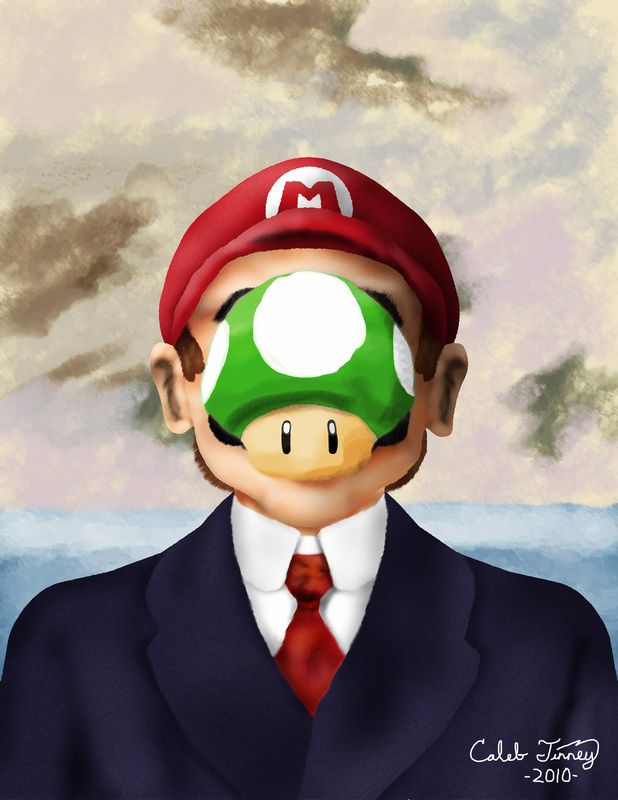 Nevertheless, this professional-looking Mario take on Magritte's "Son of Man" looks great. The painterly style is particularly appropriate. 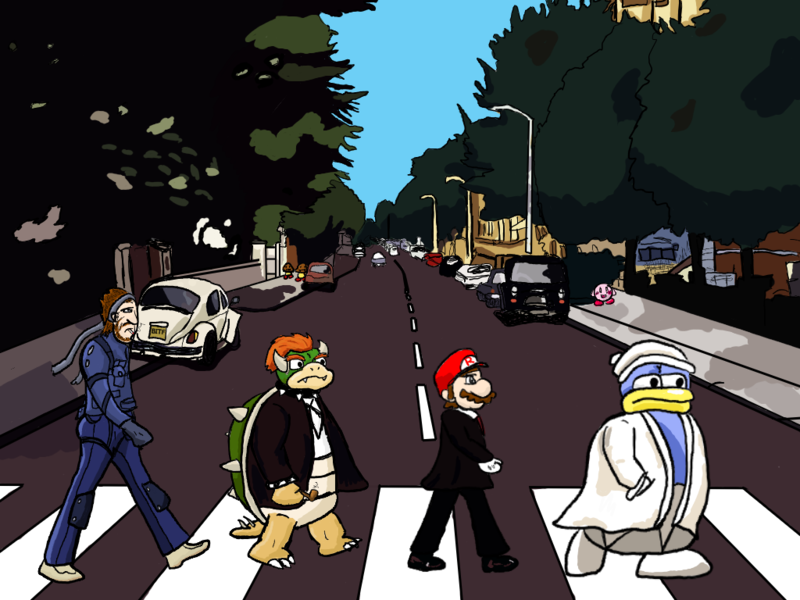 Remember that time when Snake, Bowser, Mario and Dedede formed a musical group? They were a pretty big hit, so hopefully the above image by Metaknight4ever can jog your memory. It's definitely impressive enough to pass as an album cover for this group, although given Snake's raspy voice, Mario's soprano and the villains' grunts, I'm not so sure about their music! ...and the rest is history! We felt this image was immediately striking--the composition itself is very dynamic and exciting, and the colorization on Kirby and his ship has a great look to it. The smaller details, like Coo on Adeleine's shield and Dedede's toga symbol are the icing on the cake. Thanks for a great image Ame-Nami, and enjoy your spot on the Fan Works section! Many thanks to everyone who entered as well! Be sure to check out the next contest for more drawing shenanigans. Until next time, see you around! Last edited by TriforceBun; September 17th, 2010 at 05:26 PM. This is one time where I think the absolute best one was the winner. Congratulations, Ame-Nami! Kudos! And congratulations to everybody else, this competition had a lot of fantastic pictures. 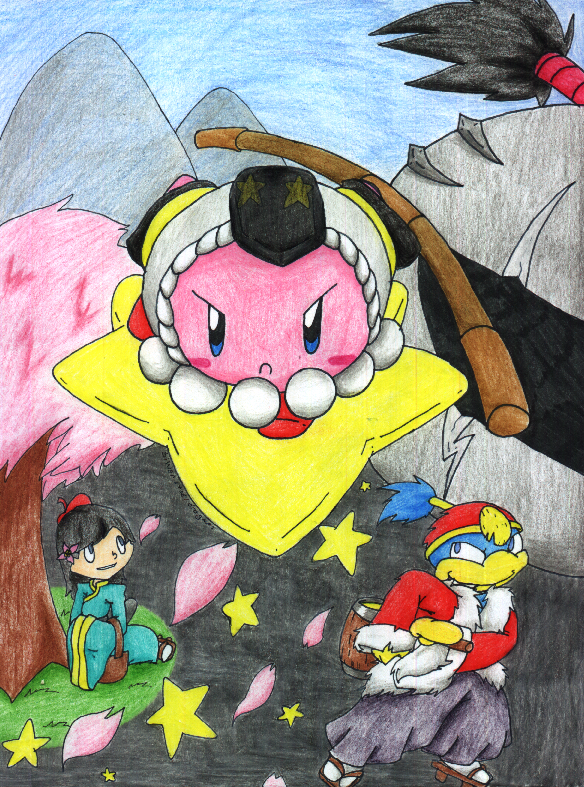 The way Kirby stood out in the picture, along with the beautiful art made you my top pick. But I knew I wasnt gonna win, anyway. Gah, there were too many good ones this round! Hey hey hey, congrats to all of those runner-ups like me, and a great congratulations to Ame-Nami! 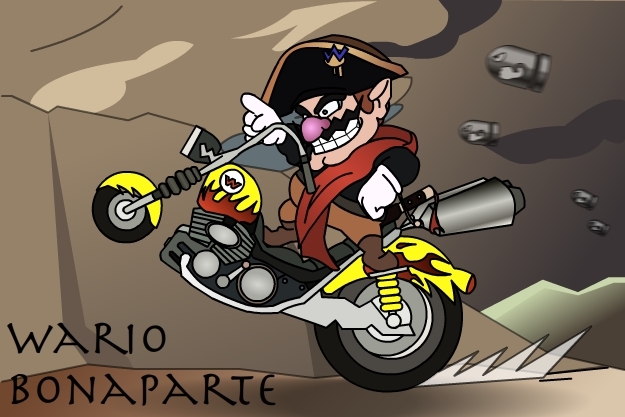 Truly fantastic work, very striking, and I love Charybdis-Wario. Great touches like that make art. But I'll try to do better, this time with colored pencils! Awesome! This was DEFINETLY the best winning picture so far (no offense to the previous winners - it's just IMO)! The judges sure know what's good and what's pure awesome sauce! Aw man! I didn't win! It's okay, though. omg Ame won ^^ YAY! 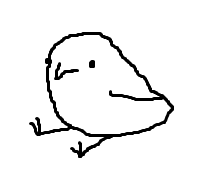 And though it's given that I can't be officially entered anymore, I'll still try to submit something for September. Good luck to everyone entering that contest! Know my power ... in art. Aw, , I lost on this with something that took me a long time to complete. I'm going all out with this month's contest! I'm going to create my finest disney related art yet! Ame-Nami, you (and all other contest winners) can absolutely still enter future contests! 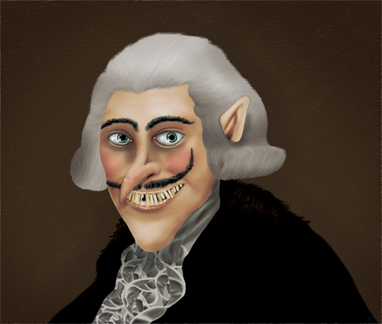 We wouldn't want to have a rule that prevents the submission of awesome entries from our previous contest winners. Enter away! Last edited by fiftyeighthens; September 13th, 2010 at 02:44 PM. Well, I'm a big jerk. I had sadly forgotten one of our impressive entries while judging (due to me going back through the thread but forgetting to go back through my email inbox). 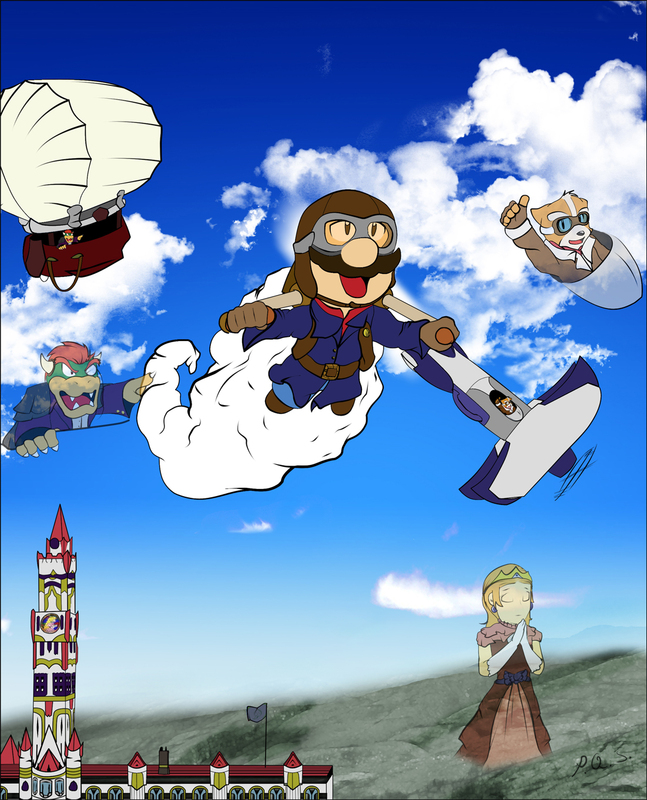 The emailed image is by P.A.S., who made an exciting steampunk Mario piece. You can see it yourself in the first post. I laughed so hard when I saw yours. You deserve a funny award. I'm wondering why Captain Mi-Falcon didn't get higher.